I admit I used a frozen pie crust for this instead of making the potato crust (lazy lazy lazy! ), but it came out wonderfully. 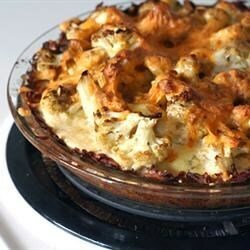 The cauliflower filling was so tasty, you could just do that step of this recipe as a delicious vegetable side dish. Yum!